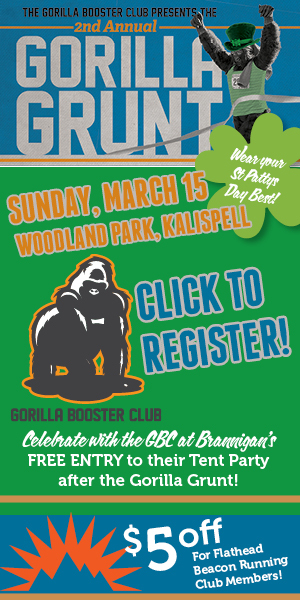 Make sure to click the button to the left to Register for the Gorilla Grunt TODAY! Whether you’re running the race for time or just want do something fun and different with your family, come check it out @ Woodland Park this Sunday! Sign up & Pay online. Pick up your Bib, Course Map & other race swag the day before the race: Saturday, March 14 from 9 AM – 1 PM @ Straight Blast Gym of Montana (30 4th St E, downtown Kalispell). See you Sunday, March 15th @ 1 PM for the 1 Mile Kid’s Gorilla Chase & Adult Run/Walk or at 2 PM for the 5K Lucky Loop Adventure Race. Make sure to wear proper shoes & dress in layers. Concessions available. Please no dogs. Registration Available onsite at 12 PM.